Another resolution is to investigate doing a radio documentary about Devlin’s Yellow Man. If you have never heard of it, it is something that my family (The Devlins) used to make and sell at the Aul Lamas Fair in Ballycastle every August. It is often compared to and mistaken for honeycomb but there are no similarities with the exception of it being wholeheartedly bad for your teeth. The recipe is a closely guarded secret and is only handed down to the Devlin woman. On other words, the Devlin men don’t know what the ingredients are but they know the “highly technical” process to create the finished product. My paternal grandmother and her sister gave me the recipe some 20 years ago and I often wonder what I should do with it to keep it alive. Intrigued? I hope so because if you are it means that a radio documentary would be of interest. 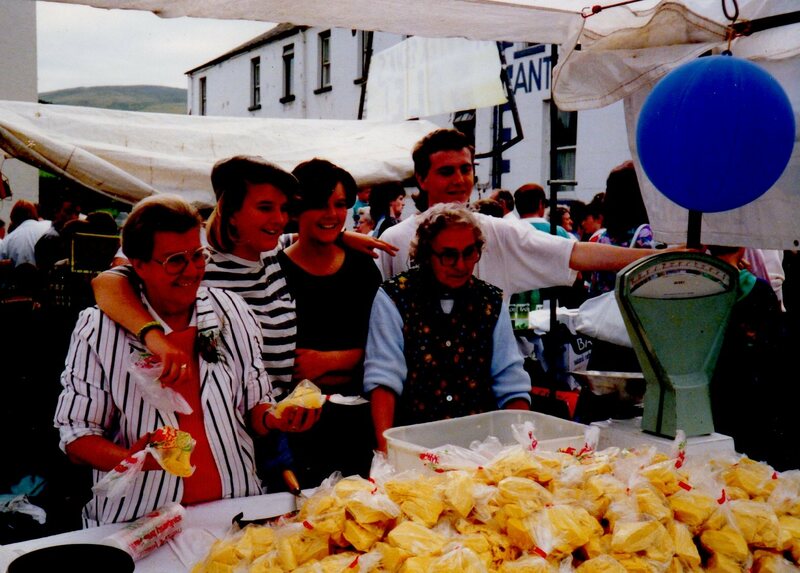 Here I am pictured in 1989 at the Aul Lamas Fair with Devlin’s Yellow Man, my paternal grandmother (Eleanor Devlin), her sister (Katie Devlin), my sister (Jo Loy) and Brendan Reid. The idea of a radio doc came to me as a result of my role hosting Best Possible Taste on West Limerick 102FM every Tuesday evening from 8pm-9pm. I’m looking forward to introducing listeners to lots of new regular slots in 2015 including a gadget one with Dee Laffan, former editor of Easyfood Magazine and the Northern Ireland Tourist Board will be helping me promote all that is wonderful about food in the North. Another project for 2015 includes hosting a food themed visit to Northern Ireland. Thanks for reading and Happy New Year everyone! Previous Post Swim Along with Me!